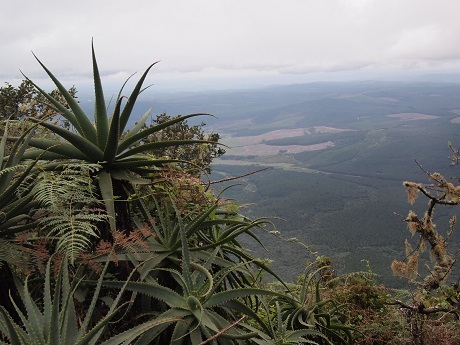 The province of Mpumalanga is what used to be the eastern Transvaal. 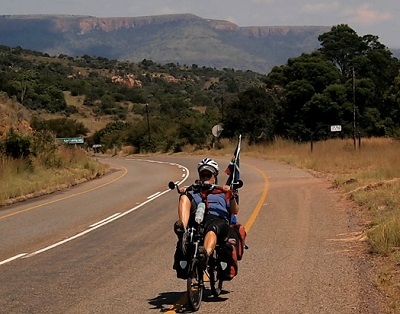 Mpumalanga has some of South Africa's most spectacular scenery, and it is also the gateway to Kruger National Park, so it is where we aimed to do our last few weeks of cycling. 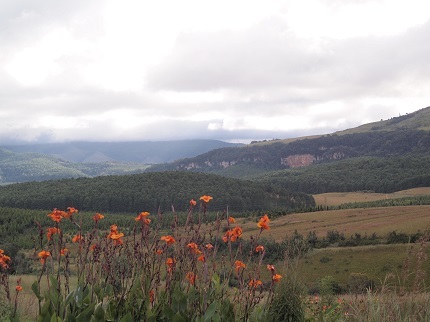 To get there, however, we had to drive through Kwazulu-Natal, much of which is also gorgeous. 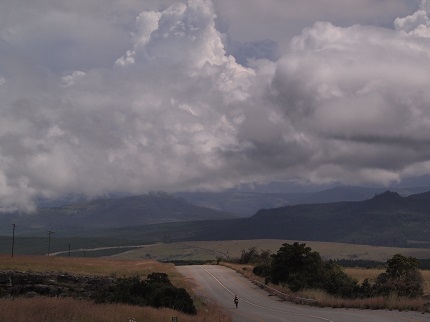 On Sunday morning we left Bulungula and the coast behind, heading northeast through Kwazulu-Natal toward Mpumalanga. 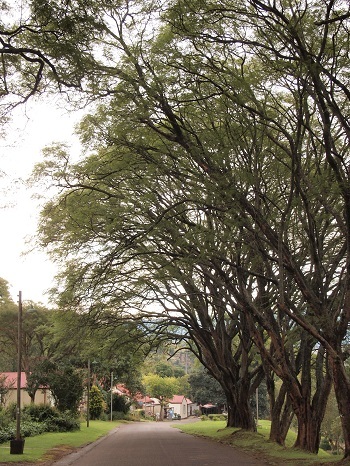 We had to make our way around congested Mthatha, the former capital of the Transkei. Beyond Mthatha on the N2 highway, we entered of Kwazulu-Natal just before Kokstad. 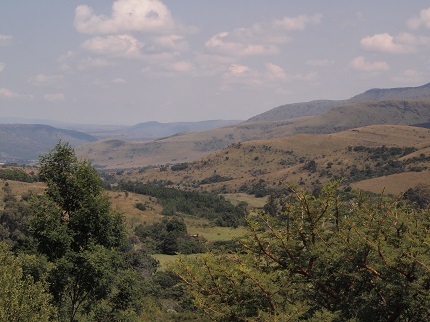 The views in this part of KZN are stunning, with rich, green, rolling land and the Drankensberg Mountains to the west. We were surprised at the number of huge commercial farms. In late afternoon we arrived at Sani Pass Lodge, a good backpackers. 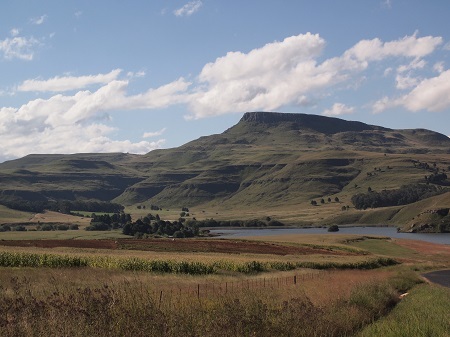 The lodge is on a road that soon turns to dirt and climbs through the Sani Pass into Lesotho. We had wanted to drive into Lesotho, but two things prevented us: We no longer had passports, and Lesotho is an independent country that requires them; also, before the top of Sani Pass the road becomes so rough and steep that only 4WD vehicles are allowed, and our truck was only 2WD. We wanted at least a taste of this spectacular area, so in late afternoon, as soon as we checked into the lodge, we started up the pass, determined to drive as far as we could, while allowing time to get back before dark. 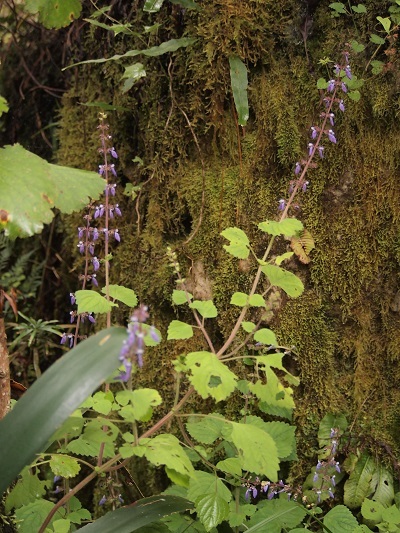 We're certainly glad that we did it; we had a good look at some extraordinarily rough and wild mountains. 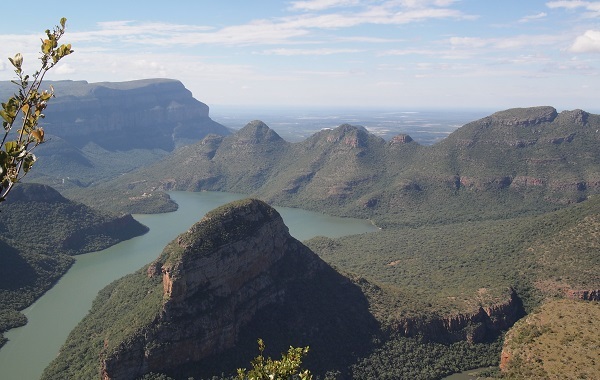 It's easy to imagine how the Drakensberg Mountains got their name: Dragon Mountains in English. 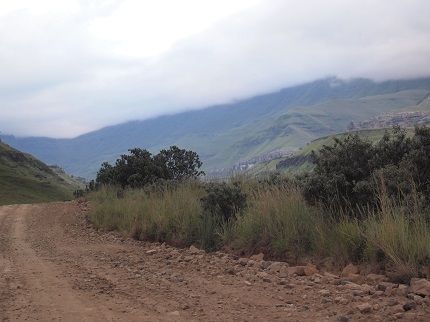 The road up Sani Pass -- before it gets really rough and steep! 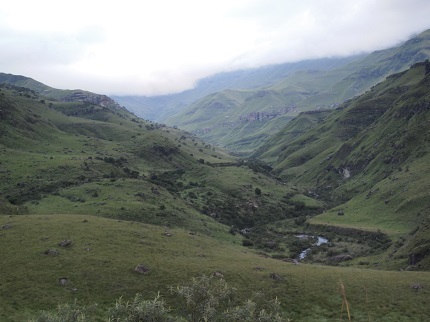 Monday, we left Sani Pass with regret; we'd have loved to stay another few days to walk in the hills. 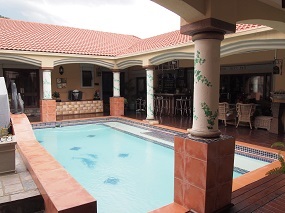 We drove for hours to reach Ermelo, a nondescript town in Mpumalanga that had places to stay. We chose badly, however, and stayed in the worst place for the worst night of this trip (so far). Our tiny room had pasteboard walls that didn't reach the ceiling. In the middle of the night a woman walked into our room by mistake; we could hear her and her man friend talking out in the hall as though they were right in the room beside us. 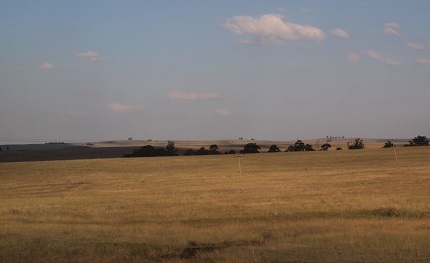 Our drive in Mpumalanga on Tuesday was pleasant at first, in ranching country, not as beautiful as what we had seen of Kwazulu- Natal. Before too long, we reached coal mining country. Double trucks loaded with coal traveled the narrow road, and we passed a huge coal-fired generating plant spewing smoke into the sky. The day was very hazy, which we thought might be pollution from the coal, but we were later assured that this wasn't the case -- that it was just excessive humidity. 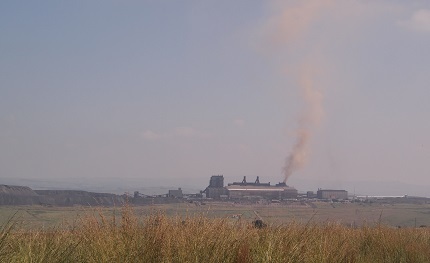 Ranch country in Mpumalanga gives way to coal country. 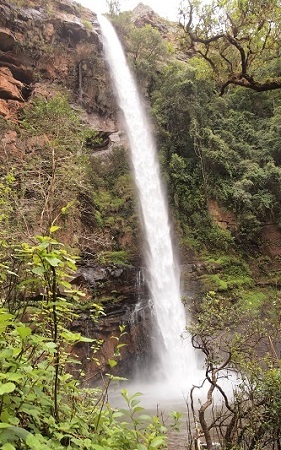 Mpumalanga gets much more beautiful than this, as you will see. We drove on Wednesday morning to White River, to meet and stay with Estelle and Errol Spencer. They own and run a sewing factory in town and live in a small home in the countryside, a couple of kilometers outside town. 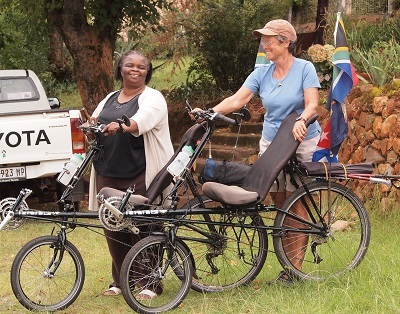 We dropped off bags at their home, returned the truck at the airport, and then cycled back to White River, stopping for lunch before meeting them at work..
We stayed with Errol and Estelle two nights, and they could not possibly have been more hospitable and helpful. On the layover day, Wally stayed at their house all day, cleaning up the bikes and updating the website. Barbara helped, but also went shopping with Estelle to replace some of the stolen items. 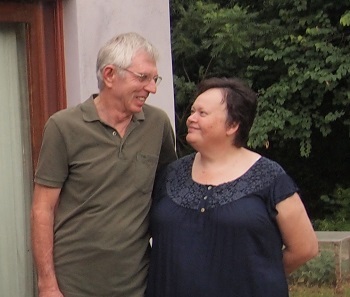 We said goodby to Estelle and Errol on Friday morning, but we expect to see them again. We'll return to pick up some things we deliberately left behind to lighten our loads; also, there is at least a chance that they will drive us around Kruger Park for a day! 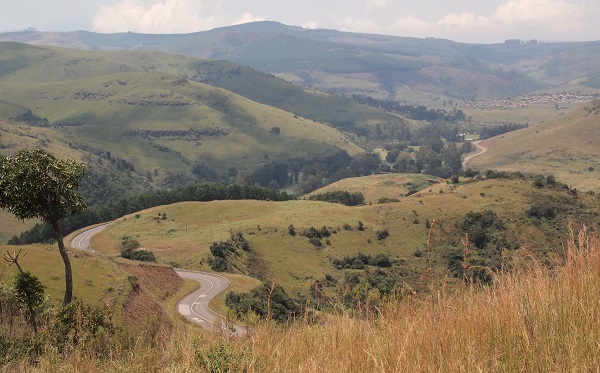 March 1- 2 Friday a.m. we cycled to Sabie, up and up, and down, and up again. It was only about 25 miles, but in little more than half that distance we climbed almost 1,000 feet -- twice! -- since there was a deep valley along the way. We have no photos of this ride, because most of the time it was pouring down rain. Sabi was a nice enough little town, and we stayed two nights at Gecko Lodge, where we had essentially a small house to ourselves, for very little money. 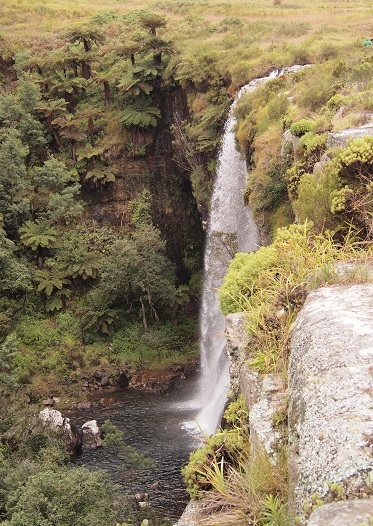 On the layover day, Saturday, we rode out to see a couple of waterfalls. We didn't leave until fairly late because the day started out drizzly. We didn't make it all the way to the second waterfall because the weather was threatening once again, and we wanted to be back in time to order a take-out Indian dinner -- which turned out to be too plentiful but pretty good. So far we haven't seen a single giraffe, and giraffe are our favorite African animals. 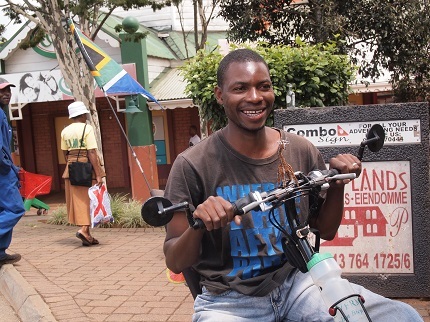 In Sabie, Barb spotted a little giraffe made of beads and wire, so we had it mounted on Wally's handlebars. 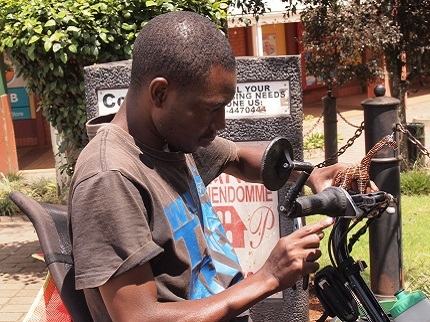 Right, a craftsman wires a giraffe onto Wally's handlebars. Below, he and a friend cannot resist trying our weird bikes. Sunday morning we rode to Graskop. 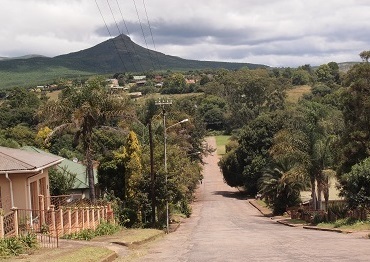 Graskop is only 18 miles from Sabie, but It was uphill nearly all the way, a net elevation gain of over 1500 feet, but more like 3400 feet of climbing because of all the ups and downs. We achieved our slowest average speed of the trip, just under 6 mph! 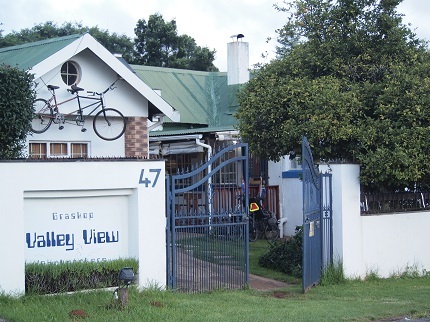 Still, we were in Graskop by late morning, and we checked into a backpackers that we like very much, Valley View Backpackers, run by a South African woman and her Zimbabwean partner. They were an intterracial couple, and that was a wonderful thing to see in this country where race creates so many barriers to friendship and love. Guests at Valley View came from all over the world, mostly young, certainly all younger than us, but we were quite comfortable so we stayed a second night and hoped to return. On Monday, our layover day, we rode around a short loop. 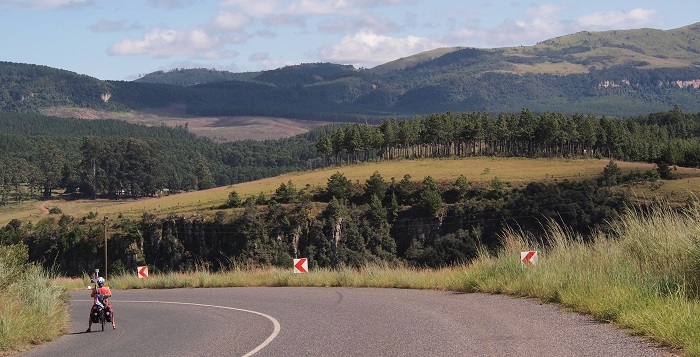 In less than 15 miles, we almost saw some of the scenic highlights of Mpumalanga. ("Almost," because the higher we climbed on this ride, the thicker the clouds and mist became, until we reached a place called "Wonder View" where we couldn't see a damned thing!) 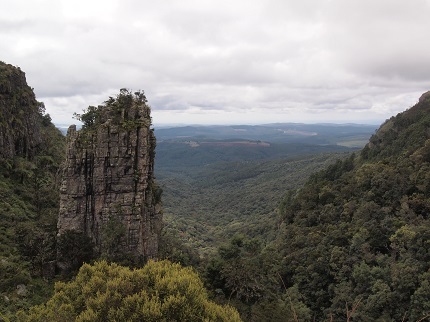 This loop ride is part of what is called the "Panorama Route," for good reason. 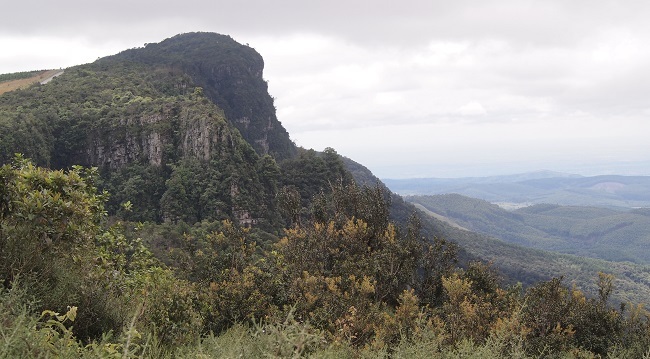 the ride involves a lot of climbing, well over 1,000 feet in five or six miles, but also a spectacular descent out of the clouds. In fact, it was perhaps the best cycling day of our trip so far. To right is Pinnacle Rock, one of the great sights along this ride -- and the one at the lowest elevation, so the view is clear. Others follow in a gallery below. just a sliver of the steep road on the left. The road from God's Window climbs higher, to Wonder View, but when we got there, we were in the clouds and couldn't see a thing. 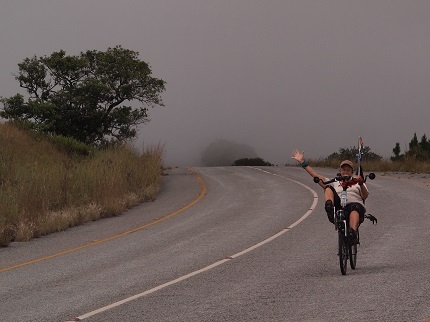 Below: Barb rides down out of the clouds, and a view of the valley below. 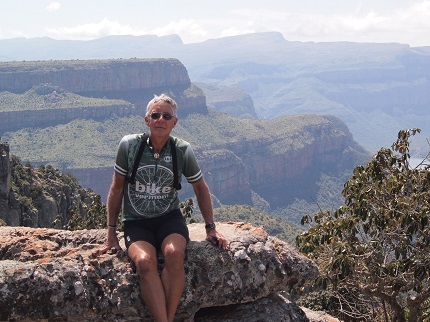 We left Graskop Tuesday morning and cycled north to the Blyde River Canyon, one of South Africa's lesser-known natural wonders. It is supposed to be the third biggest canyon in the world. The 40-mile ride on the Panorama Route involved more long climbs, and the day grew hot, but It was worth it. 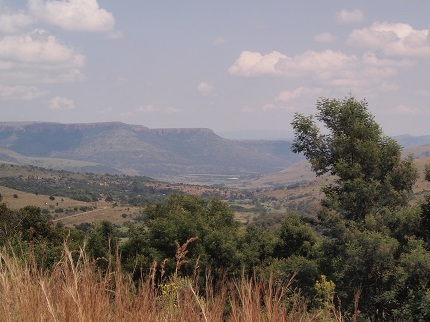 Sights along the way included The Potholes, the Lowveld View, and the "Three Rondavels," rock formations so named because of their resemblance to traditional African round huts. 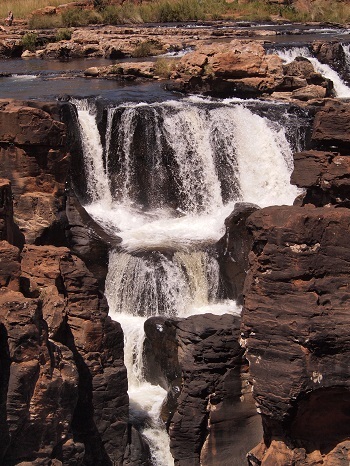 Falls on the Blyde River, left, just before The Potholes, right. Farther along, the river scoops out a huge canyon. 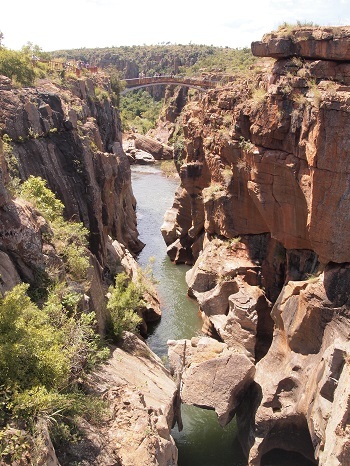 Wally at Blyde River Canyon -- a great view spoiled! 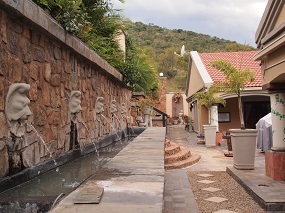 We camped for the night at a Forever Resort, part of a chain of large, self-contained holiday resorts with all sorts of expensive accommodation, a big pool, lots of activities, and for us, a campground. The campground was beautiful, and troops of pesky but cute monkeys were a bonus. Barbara was angry that I didn't take photos. Food was the problem. The only choices were a wretched convenience store or an overpriced buffet-only restaurant. We packed up first thing in the morning. From Forever Resort Blyde Canyon we cycled on Wednesday to Ohrigstad, a small town in an area of prosperous commercial farms. 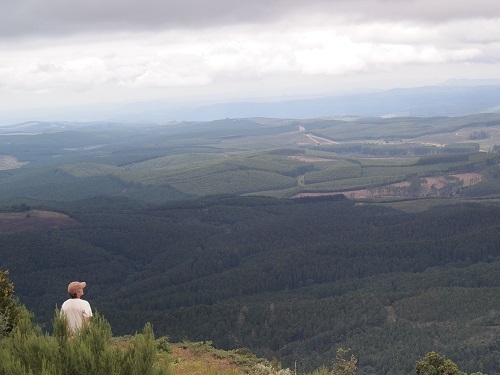 We had no idea that there was this much farming in Mpumalanga. We also had no reliable information about Ohrigstad; it's not our guidebook, and the internet told us nothing. Riding into town, as far as we could see, there was only one accommodation, Royal Palm B & B, so we went there. It was uphill and on a dirt road, and we didn't know what to expect. It was spectacular! Photos below will attest. It was FAR more expensive than anyplace else we have stayed, and it wasn't our style. So, off we rode again the next morning. Thursday morning we stayed for breakfast at Royal Palm B & B since we were already paying for it. That made us a little later getting started than we wanted to be. At first the ride to the south was easy and pleasant, but the heat was gradually building up. By the time we turned east to climb Robbers Pass, it was in the 90s, sometimes over 100 degrees in the direct sun. Barbara was particularly miserable, though she didn't complain. The climb wasn't terribly steep, but it seemed to go on forever. At least two or three times, we thought we were at the top; but then the road went around a curve and continued upwards. In fact we climbed about 2,300 feet in 20 miles. When we finally were enjoying the long, long descent to Pilgrim's rest, Barbara's front tire blew out, and she had a fall. It wasn't a bad one -- she scraped her elbow and probably bruised her side -- but it wasn't a perfect ending to the difficult ride. The tiny, antique gold-mining town of Pilgrim's rest is a tourist attraction, but we liked it -- especially the trees (right). We ended up in a room at Beretta's Guest House. 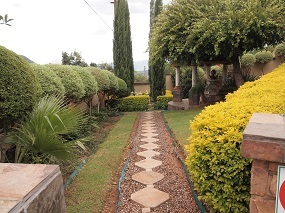 Joyce Chabalaba, the owner, is a large, friendly African woman who is welcoming and thoughtful. (Joyce and Barbara, below) We liked her guesthouse well enough to stay for two nights. When we went out to dinner the first night, Wally had mealie-pap, which is the same thing as sadza in Zimbabwe, with a tomato and onion relish and boerewors, Afrikaner sausage. It was so good that he had it again the next night. The first night we also had a furious thunderstorm that went on and on. 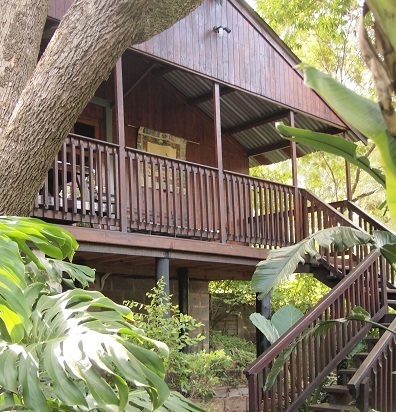 From Pilgrim's rest, we rode back to Graskop on March 9, to the same nice backpackers we'd used before, Valley View Backpackers. 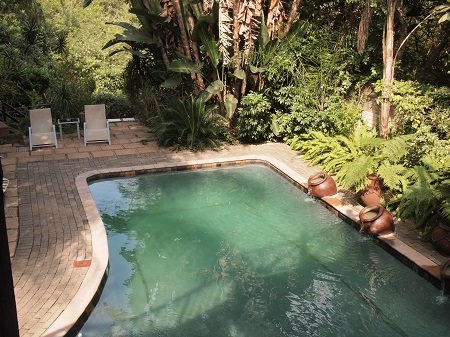 From there, we began the next part of our journey -- a visit to Kruger National Park.